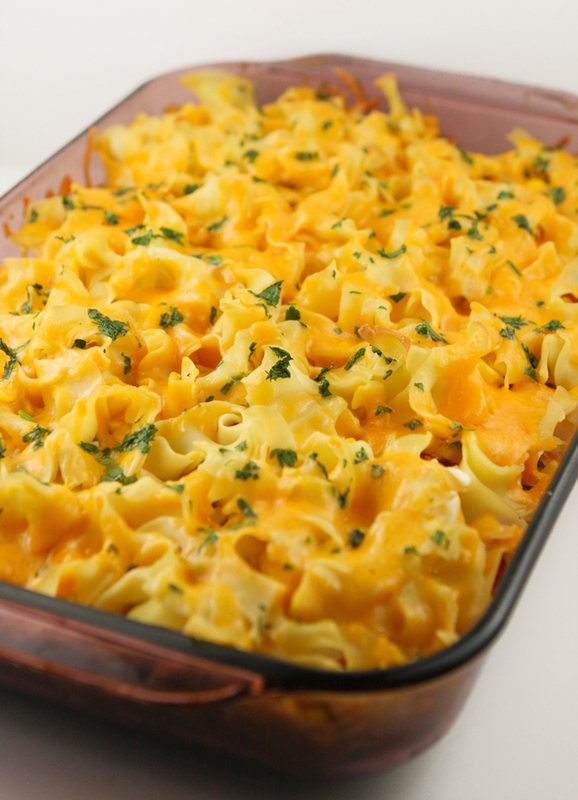 Easy Cheesy Noodle Bake Recipe — Pip and Ebby - easy, delicious recipes! This is the perfect weeknight dinner for busy families. Filled with egg noodles and two kinds of cheese, ground hamburger and lots of flavor, you will be filled up! It is EASY, comforting and there's not a single person at the table who won't love it! Dan and I used to make a version of this dish years ago. We have often remembered it fondly, but for some reason we haven't replicated it until now. So silly. Our original version contained jalapeño peppers and I recall them adding the perfect zing. This version was made sans jalapeños in order to not burn the mouths of our young ones. 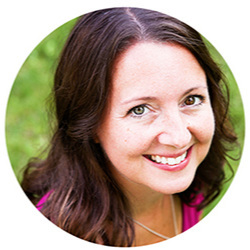 I have found myself many times over the past few days crouched down in front of the open fridge, fork in hand, sneaking just "one more" teeny bite. It's a keeper. We will not be waiting another seven years to make it again! If you love easy and cheesy, be sure to check out these delicious dinner recipes, too: Beefy Ranch Shells and Cheese, Cauliflower Mac and Cheese and Easy Chicken Pot Pie! The perfect weeknight dinner for a busy family! Preheat oven to 350 degrees F. Coat a 9x13 baking dish with cooking spray and set aside. In a large saucepan, cook egg noodles in boiling water until al dente. Drain and rinse. In a medium skillet, cook the ground beef, onions, salt and pepper over medium heat until the meat is no longer pink and the onions are soft. Remove from heat. 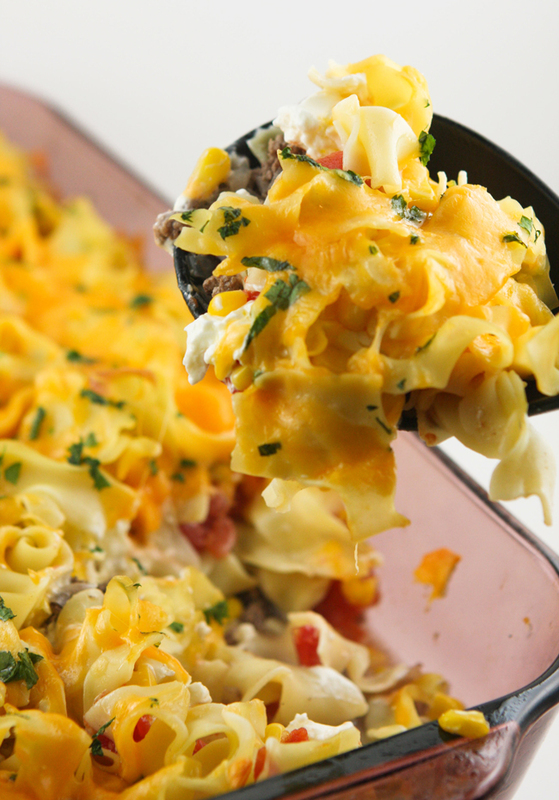 Layer the prepared baking dish as follows: ground beef-onion mixture, half of the noodles, one can of tomatoes, cream cheese, corn, remaining half of the noodles, second can of tomatoes, shredded cheddar cheese and parsley. Bake covered in the preheated oven for 45 minutes. Remove cover and bake for an additional 15 minutes.